It was very sad to hear last month that Roy Bentley, the star post-war footballer of the West London soccer scene during the 1947-62 era, had passed away at the ripe old age of 93. In his spell as a centre-forward at Chelsea (1947-1956), he was without doubt the crowd favourite and his goals were instrumental in them winning the Football League Championship in 1955. Subsequently moving on to Division 2 Fulham (1956-1960), Roy switched positions to centre-half where he was a dominant feature of the defence. As a very young kid myself, I recall seeing him play at Craven Cottage when on occasions my father, a stalwart Fulham supporter, used to take me along to watch a game when the R’s were playing away. He was a very important part of Fulham’s triumphant promotion to the top flight (1959) and their famous FA Cup run in 1958, when they were eventually beaten by Manchester United in a semi-final replay. At the tail end of his playing career he signed for the R’s (1961-62), where he played mostly at right-back as a replacement for the departed Pat Woods. The Bentley/Ingham full-back partnership had the oldest combined age for those positions in the entire Football League, but in my view they were the best full-back duo performing in Division 3. The only time I can remember Roy being given the run around by opposition forwards was in the midweek Division 3 league home fixture against Reading on the 21st August 1961, when Rangers lost 3-6. Other than that he was rock solid stability personified before the march of time gradually caught up with him and he left the R’s in the early part of the 1962/63 Loftus Road/White City season. Roy Bentley was quite a unique, fit, physical specimen virtually right up to the end of his life. I understand that he was still playing some golf when in his 90’s. R.I.P. Roy Bentley. It was an honour and a pleasure to have seen you play both for Fulham FC and Queen’s Park Rangers FC. Son of a rugby player, Roy was born on the outskirts of Bristol, in Shirehampton on 17th May 1924. He was called up by the Royal Navy during WW2 and served on various destroyers that were escorting the Atlantic convoys. Roy played for both Bristol clubs before signing for Newcastle in 1946. Then in January 1948, he signed for Chelsea for a fee of £11,000. He gained 12 England caps between 1949 and 1955, scored nine goals, and was part of the 1950 World Cup squad. Someone described him as the first deep-lying centre-forward in English football, in the style of the Hungarian international player, Nandor Hidegkuti. 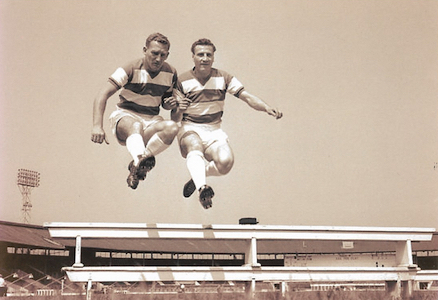 Following his move to Fulham in 1956, Roy reverted to centre-half and Alec Stock brought him to Loftus Road five years later. Roy made his debut for the R’s against Brentford on 19th August 1961 at the age of 37 years, and 94 days, making him QPR’s second oldest ever debutant. He went on to make a total of 52 appearances for the Rangers. He retired from playing at the end of 1962, but Roy was set to line-up in Alec Farmer’s testimonial match at Loftus Road the following May. Roy took over as manager of Reading the following year and in 1969 moved on to Swansea City, where he won them promotion to the old 3rd Division. Roy Bentley.A true credit to the game!